She was not particularly concerned for her own reputation. She had been in far more compromising positions than afternoon tea with a single gentleman in a public place. He was seated at the table and stood as she approached. Tall but not excessively so; considerate in manner as he assisted her into her seat; and authoritative without bluster as he caught the attention of the waitress so they could give their order. “Kind of you to see me, Mr Cryer,” she said as she extracted her notebook and pencil—so much more reliable than a pen. He sat back comfortably into the seat. “I’m not sure I understand why you want to talk to me, Miss Churchill,” he said as the waitress arranged their cups and the teapot on the table, then brought over a selection of cakes. He waited for her to make the first selection, and she took the Battenburg. It was not an idle choice. The way his eyes followed the cake assured her that her information had been correct, his young lady liked Battenburg. He selected a macaroon. “I understand that Lyons maintains their own dairy herd in the vicinity,” she said into the silence. She looked. The masses passing to and fro consisted perhaps one quarter Europeans, the rest were Sinhalese, Indian, Chinese, African and who knew what else. The Compound was more cosmopolitan than any other part of the empire. “My parents were commoners if that’s what you mean?” Which was a comment about her own rather more exalted birth—though not as exalted as people thought. Her father was the fourth son. He might have been a “Lord” but his title was not hereditary. And her mother was an American, which had never gone down well. He did not answer but instead took a sip from his tea cup, eyeing her over its white and blue pattern. “I didn’t see that in any newspaper,” he said. He was infuriating, without even the slightest betraying flicker in his eyes. This was not the man she thought she was meeting, all the reports said he was quite malleable—certainly Miss Anderson had him wrapped around her little finger. He almost dropped the macaroon. She was glad that piece of information was accurate, at least. She opened her bag and removed a folded sheet of paper. She held it out to him. He brushed the crumbs from his fingers and took it. He unfolded it and looked at the picture. She studied his face, looking for a sign. Did he pause slightly overlong? “What is this?” he said as he dropped the drawing on the side of the table. The curious oblong construction that might have been mistaken for a very large railway coach, except it lacked for wheels. “I need to know what you know.” She knew she sounded pathetic, pleading almost. Then he stood, gathered up his coat and walked away. 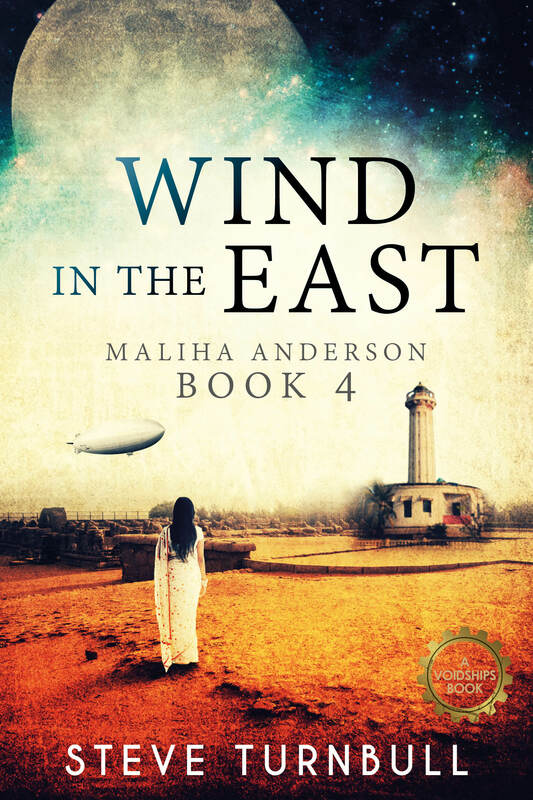 Buy the first three Maliha Anderson stories in one volume.